New product: TeraSys®- AiO, featuring TDS spectroscopy in transmission, reflection, and imaging, all options in one system up to 14 THz. The taxi fare from Zurich Airport to Rainbow Photonics is about 75 CHF and the trip takes about 25 minutes. You need a daily (8 CHF) or an hourly (4 CHF) ticket for the Zurich Zone 10, which you can buy at the automats at every stop (no need for the exact change). After purchasing the ticket, take Bus 31 from Bahnhofplatz/HB (direction Schlieren, Zentrum) and get off at the Farbhof stop. The bus departs every 7 minutes and the trip takes about 18 minutes; see the timetable. Alternatively, you can take an S-bahn (fast train) to the Zurich Altstetten station. You can take S3, S9, S12 and S15, all departing from platform 21/22 in Zurich HB (Hauptbahnhof); the trip takes about 6 minutes. 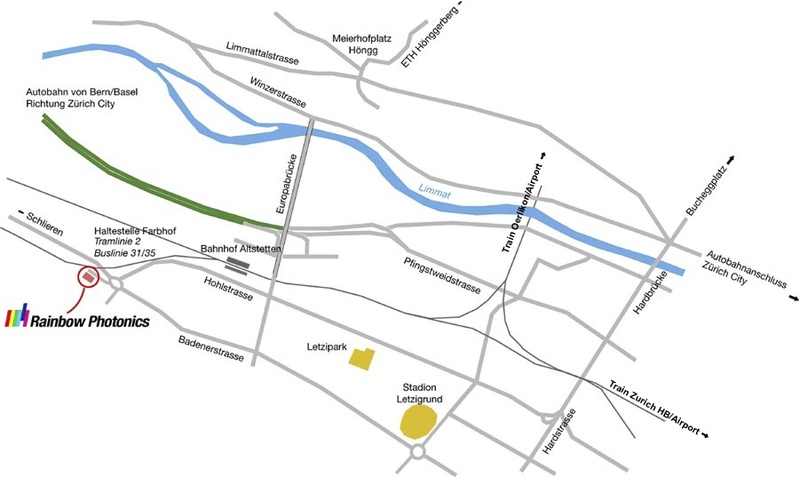 At Bahnhof Altstetten, take Bus 31 (direction Schlieren, Zentrum) and get off at the Farbhof station. The whole trip takes about 15 minutes; see the timetable. You need a daily (12.40 CHF) or an hourly (6.20 CHF) ticket for the Zurich Zone 10 and Zone 21. There are trains to Zurich main station (Zurich HB) about every 10 minutes, and the trip takes about 10 minutes. At the main station, follow the above instructions.